In the early summer of 1968, Paul McCartney telephoned esteemed war photographer Don McCullin to ask him to spend a day photographing The Beatles. The group was in need of new publicity images, and wanted to get away from the recording studio temporarily. The chosen day was 28 July 1968. The Beatles and McCullin were joined by five others with cameras – Ronald Fitzgibbon, Stephen Goldblatt, Tom Murray, Tony Bramwell and Mal Evans – plus Yoko Ono, McCartney's girlfriend Francie Schwartz, and Gary Evans, Mal's six-year-old son. There were seven key locations around London in what became known as the Mad Day Out. The first location was Thomson House, the centre of the newspaper empire owned by Lord Thomson, where The Times and The Sunday Times were based. The building, on Gray's Inn Road, was demolished in 1969. Thomson House had a photographic studio in its penthouse, which had been built for photographer Lord Snowdon and was often used by Apple's snappers John Kelly and Stephen Goldblatt. 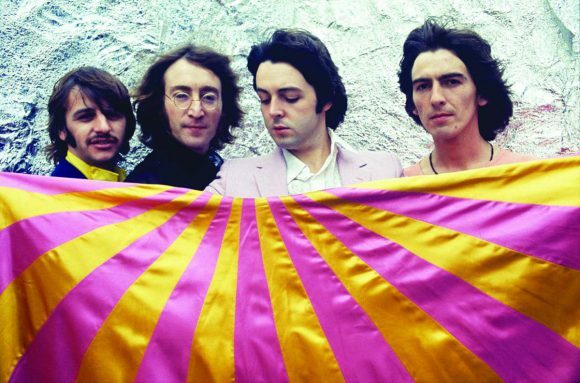 For the first shots, The Beatles stood against a blue backdrop and a fan was pointed at them to blow their hair away. 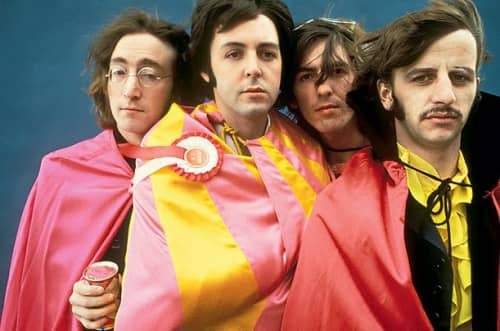 While in the studio the group also used props including: four coloured sheets which were used as capes; a Liverpool Football Club rosette worn by McCartney; crash helmets and diving googles; a boot, positioned on the head of Ringo Starr; and a bugle, played by George Harrison. A crumpled aluminium foil background was also used in some photographs. The wind machine was throwing their hair around and their famous faces looked like the figures on Mount Rushmore. To my amazement it worked and we got a beautiful cover. Thinking back on it, Life used to pay five hundred quid for a cover so maybe I actually lost out on it, but I was thrilled. Location two for the Mad Day Out was at the Mercury Theatre in Notting Hill, London.